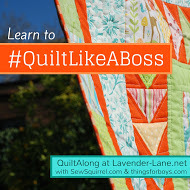 Welcome to the next post in the #quiltlikeaboss series. Today I’ll be talking about my design inspiration. Baby quilt sized – The design needs to be bold, so the baby can see it. Babies can only see high contrast things are first. Using pre-cuts or pre-assembled fabric packs – I find it hard personally making all the fabric choices individually. For gifts, I prefer to buy either charm packs, layer cakes or pre-bundled ranges of fabrics. This means that one element, making sure the fabrics work together is already considered. I then consider all the fabrics as a whole. Feature some applique – Why not? I fancy trying something new, and a baby quilt is small enough if I hate doing applique, there isn’t much to do. The gift recipient – Let’s be honest, a baby quilt is really for the parents. Making sure it fits their asthetic is important, and then worry about gender stuff. HOWEVER. I have made a quilt for someone who knew they were having a girl, and then at the 35 week scan…I was literally sewing on the binding when I got the text message that the sonographer got it wrong, and it was a boy. With a pink quilt. Strongly recommend gender neutral here people. Time – I need to be able to make this before the baby arrives, so no fancy pants patterns here. I want simple, beautiful and quick. This also includes where I source the fabric from. As mentioned above, my quilt will be made from pre-cuts. So what does that mean? Jelly Roll. A jelly roll is co-ordinating fabrics, pre-cut into 40 strips, measuring 2 1/2″ x 42″. Personally I don’t like jelly rolls as they are really limiting. The only baby quilt I’ve ever made from a jelly roll was just strips sewn together. Layer cake. A layer cake is co-ordinating fabrics, usually pre-cut into 42 blocks, all 10″ x 10″. General pre-cut. This is often a whole range of fabric. A designer will release 10-20 co-ordinating fabrics from a set colour palette. Often these can come as fat quarter packs. This means that the fabric will be in 50cm x 50cm squares precut. You can receive any quantity of fat quarters. If you are a purely visual person, you could just cut straight to my Pinterest board. The first thing I did was to scope out the parent to be’s Pinterest board. This was so see if there nursery had a theme, or if their general design sense went one way or another. This person had classic designs, that didn’t dominate a room or be too gender specific. They also loved cotton and Steele and art gallery fabric. With that in mind, I decided to focus on pre cuts without a really strong theme, and in gender neutral colours. By that, I mean there are no bright Pink fabrics with brown and orange owls. Super cute, but not what this parent would buy, so not what I would gift. So then, I just googled fabric shops, and started browsing with a glass of wine! Houston, we have fabric. I repeat, we have fabric. The lovely ink and spindle quilting weight cotton it is. There are 12 fat quarters included, and that should be plenty. Looking back over my board, I’m trying to pick what will look good with some applique, and suits the fabrics. Large prints don’t suits being cut into small blocks, and sometimes small prints look more balanced chopped up. This could be nice, lots of straight lines but how would the applique look on top? So you can see, I’ve already got a fair idea of what it’s going to look like. It’s going to be blocky, and use the applique as a feature, but not the entire focus of the quilt. I’m going to consider applique at the same time, as different designs might change my opinion on which patchwork design to use. As my fabric is Australian, I was thinking about trying to make a possum magic quilt. The difficulty with that, is the images are so iconic, but wouldn’t work without fine detail. If it would be recognisable as a silhouette, then it’s good. Then I was thinking about Australian Flora, but would gumleaves just melt into the back and be too much? I’m looking for a design to do in a dark colour, in silhouette, that makes me have feels. But not owls, or boats or kitsch. Tall order.